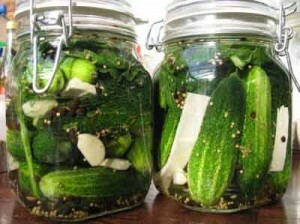 Lacto-fermenting is another way of pickling. Instead of using vinegar, you use a salt solution and wait for some special (naturally existing) bacteria to work their magic. The gherkins retain more of their vitamins and there are other health benefits too. More importantly, they don’t have that overpowering vinegary tang and taste delicious. Here’s the science bit: The salt solution favours the proliferation of lactic acid bacteria.These bacteria (of which there are many species) ferment carbohydrates into lactic acid, carbon dioxide and other organic acids without the need for oxygen. This turns the solution acidic and replaces the air at the top of the jar with carbon dioxide gas. So, other (unwanted) bacteria will now not be able to reproduce. A lot of recipe books will contain warnings, or not include this method of preserving at all. But this kind of fermentation has been used across the world for centuries. We have come across plenty of food preserved this way on our culinary travels. In Poland we loved the big barrels of gherkins and cabbage (i.e. sauerkraut); in Turkey we ate and drank yoghurt with everything we could; in Morocco our chicken tagines came with preserved lemons; in Mali we drank lots of millet beer; and in Ghana we filled up on fufu (fermented cassava and unripe plantain, pounded to a sticky stodge). 3 one litre (1 ¾ pint) glass preserving jars – sterilised. You’ll need Le Parfait style jars with rubber seals and metal clips that allow the gas to escape. 1 To sterilise jars: Run them through the dishwasher, or wash in hot soapy water and rinse well. Then place on a tray in oven and turn oven on to 150C. Once reached 150C leave it 10 mins, then turn off and leave jars to cool inside. Alternatively, place clean jars in a large stock pot lined with a rack or tea towel and cover with cold water. Slowly bring to a boil and boil 10 mins. Lift jars out carefully with tongs and let steam dry. Never wipe sterilised jars with a cloth. 2 Mix salt into water until it dissolves. 4 Pour brine into jars, ensuring contents are totally submerged. The brine should not come more than ¾ inch below the rim. Close jars. 5 Leave at room temperature for a month. During this time fermentation will produce carbon dioxide which will escape past the rubber seal. The air at the top of the jar will be replaced with carbon dioxide and the brine will turn acidic. If you want to check they’re fermenting, open jars to hear gas fizz out. 6 Now move to a cool, dark spot and use within a year. Once opened, keep chilled. Anna Colquhoun, The Culinary Anathropologist, is a cooking teacher, food writer and consultant on BBC Radio 4’s The Kitchen Cabinet, and the author of Eat Slow Britain. She works closely with Riverford Organic Farms and has developed many preserving recipes the for it’s customers. Anna has travelled all over the world to research and write about her subject.